CHARRED RUINS — Firemen dampen the smoldering ruins of the Golden Stallion, Pioneertown restaurant which burned down yesterday. The third fire in a week in tiny Pioneertown burn the Golden Stallion restaurant to the ground yesterday, causing more then $50,000 damage, the California Division of Forestry reported. Only two days before A $45,000 fire destroyed the Red Dog saloon a block away. The three fires were apparently unrelated. CDF officials said. Pioneertown, the village of some 50 persons built as an old west movie set in the mid-1940s, is four miles northwest of Yucca Valley off Pioneertown Road. A popular high- desert recreational area, it lost its only two bars during the weekend. Yesterday’s fire was reported at 3:45 AM and the last fire unit left after 4 p.m., 12 hours later. A light breeze fan the flames as the lake at creosote – soaked railroad ties of which the restaurant was built. Martin D Read, fire truck driver in charge of the three CDF trucks at the scene, said an employees smoking started the fire. Harold Stan Holland, who was sleeping in the living quarters at the back of the restaurant, was burned slightly but managed to escape through a window. About 12 firemen fought the stubborn blaze from six fire trucks supplied by the Yucca Valley Fire Department, the Morongo Valley Fire Department, and CDF stations in Yucca Valley, Lucerne Valley and Yucaipa. Capt. Fuller A. Johnson of the Yucca Valley Fire Department said the fire had almost been contained when a light breeze came up about 2:20 a.m. and fanned it into life. 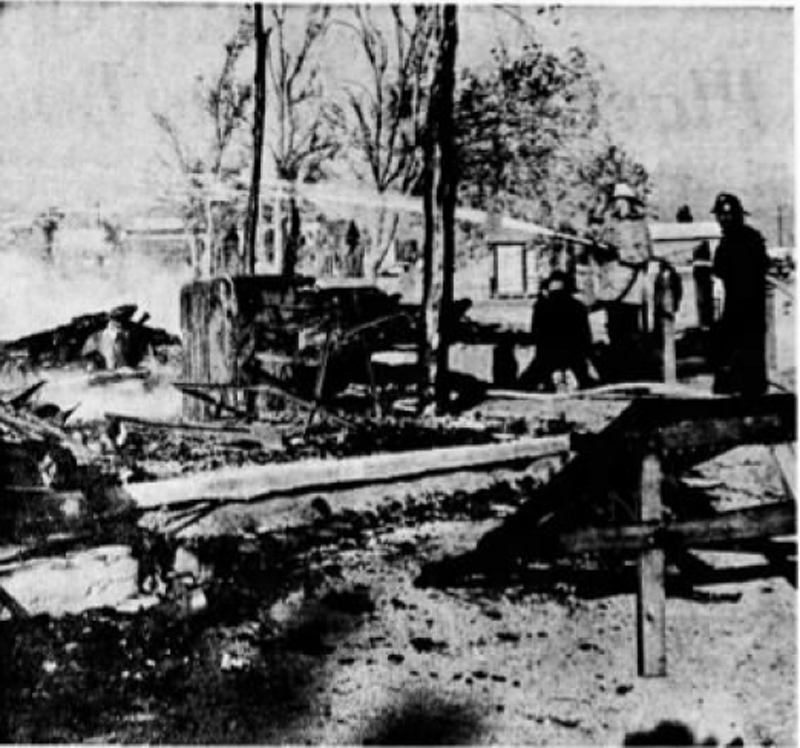 The fire was under control by 7:30, but the railroad ties continue to burn four hours afterwards. The Golden Stallion was a 50-by-100-foot structure containing a dance floor, dining room, bar, offices and living quarters. Jack Bailey, actor in the “Queen for a Day” television program, bought the restaurant about six months ago. CDF officials estimated the Red Dog fire, which started in the kitchen stove area early Friday morning, cost $20,000 damage to the building and $25,000 to the contents. Last Monday’s fire caused $3500 damage to the outside of the Red Barn, A private home and Pioneertown landmark. Officials attribute it to poor wiring. Paramount Pictures Corp. and Universal Studios reportedly built the 14 old west structures of Pioneertown Mane Street in the mid-1940s. Many of the next decade’s westerns were filmed there, including the movies of Roy Rogers, Gene Autry, and Tom Mix. The film studios left in 1955, and the town fell into disuse. About a year ago, but California Golden Empire Corp. start to lay out subdivisions near the old western town.